In meetings, keeping a list we call the "parking lot" is a fairly standard practice. As the discussion unfolds, we "park" there any items that arise that aren't on the agenda, but which we believe could be important someday soon. Here are some tips for making your parking lot process more effective. 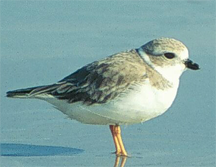 The piping plover, a threatened species of shore bird. One conjecture about the incidence of parking lot items is that we tend to generate them when our creativity combines with innovative projects in settings that lack sufficient resources, or sufficient stability, to support fuller exploration of the many opportunities we uncover. A similar phenomenon might be occurring in nature. Observations indicate the existence of a species gradient from the Earth's equator down to the poles. If we consider extinction as analogous to the evolutionary "parking lot," it's possible that more species are being "parked" at high latitudes due to perturbations in high-latitude environments, such as the blooming of the human species (in the case of the plover), or perhaps repeated glaciations. Whether the environment is responsible, or whether differences in speciation and extinction rates are responsible, is an open question. See a recent letter to Science by Charles R. Marshall, and a responding letter from Dolph Schluter and Jason Weir, in Science , 27 August 2007, p. 451. Their original article, "The latitudinal gradient in recent speciation and extinction rates of birds and mammals," appeared in Science , 16 March 2007, p. 1574. Photo courtesy U.S. Fish and Wildlife Service. Whether you call it the parking lot, the issues bin, or the issues list, accumulating contributed items that aren't quite on topic during a given meeting can help keep the meeting focused and moving forward. Here are some tips to help you get more from the practice, or to motivate you to start. Enter the items on a flip chart or other medium that's visible to all. Visibility helps deter duplication, and it might spur additional creativity. A meeting of more than about seven people needs a parking lot valet — someone to record the items, and to verify that the contributors agree with the wording. For smaller meetings, the scribe or recorder can play the valet role. Encourage meeting attendees to self-park. That is, if a contributor knows in advance that a contribution will be parked, why not add it to the parking lot after the meeting? Although there is some value in announcing the contribution during the meeting, the time lost doing so is also valuable. A very brief end-of-meeting review of the parking lot should assign to each item someone from leadership to "own" it and follow it to resolution. Every item from the parking lot should make a later appearance as a part of a future agenda item, or on the next edition of the parking lot resolution list, or on the cumulative parking-lot-awaiting-resolution list. Nothing should disappear into the void. Each item's owner is responsible for tracking it. Track the contributors of parked items. Investigate why some people repeatedly offer items that end in the parking lot. Do they not understand the agenda? Are they uniquely brilliant? Are their concerns being ignored? Why are they not self-parking? Compile all parking lots, and examine them for patterns. Are some kinds of items repeatedly parked? If so, perhaps these are issues that need attention, or perhaps some people are preventing them from getting attention. Track the contexts in which parking lot items appear. A high incidence of parked items might indicate that the group hasn't been proactive in that topic area — the issues involved are "running ahead" of the group. The term parking lot is an Americanism. Even though the British call them car parks, my colleague Graham Oakes reports that the term "parking lot" works in the context of meetings in the United Kingdom. My colleague Nynke Fokma reports from other European languages: Bent (Danish) says, "Boette" (Marmalade jar); Emmanuel (French) says, "Parking"; Nynke (Dutch) says, "Even opzij?" (Aside for now? ); and Marco (Italian) says, "Possiamo parlarne dopo?" (Can we talk about this later?). More reports: Mary Ann (Tagalog (Phillipines)) says, "Tsaká na" (Later). Christine (Sydney, Australia, where she works with environmental organizations) says, "Let's park that in the bike rack for later." If you send me your term from your own language, I'll post it. Would you like to see your comments posted here? rbrenNjulgrFEXBQtvNWpner@ChacKBKcplcwhrFSOTRsoCanyon.comSend me your comments by email, or by Web form. Much of the conventional wisdom about teams is in the form of over-generalized rules of thumb, or myths. In this first part of our survey of teamwork myths, we examine two myths about forming teams. I offer email and telephone coaching at both corporate and individual rates. Contact Rick for details at rbrensRZHwHSseulcvtGjner@ChacNnypoCakOufkAAvSoCanyon.com or (650) 787-6475, or toll-free in the continental US at (866) 378-5470.